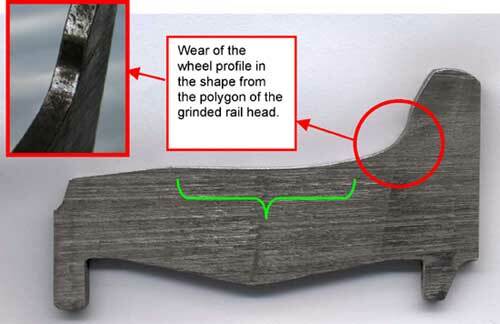 Rail grinding and wheel re-profiling are essential elements of track and vehicle maintenance. These maintenance procedures have been shown to play a major role in the removal of surface defects or irregularities, and in controlling the shape and surface conditions of wheels and rails. Although the benefits are well known, in many cases, they have not been translated into daily practice. Many urban transit systems that provide metro and tramway services continue to grind rails, for example, based on pre-determined maintenance plans, rather than in response to a specific rail condition or strategy to optimize or improve wheel / rail interaction. Pre-determined grinding plans tend to concentrate on removing short- and medium-wavelength corrugations, and undulating deformations of longer wavelengths. Most of the grinding equipment used on urban transit systems does not incorporate non-contact measurement technology and, therefore, is unable to identify and remove longer wavelength corrugations. Nor can the grinding equipment provide any consistent comparison of the pre- and post-grind rail conditions. While interchange railways operate a wide range of vehicles with wheels in varying maintenance conditions, urban and suburban passenger systems typically operate a captive fleet of vehicles, about which, wheel wear patterns and conditions are well known. In some cases, wheel wear can be controlled by operating specific vehicles on specific lines. Wiener Linien, Vienna’s public passenger transport organization, realized the need to match vehicle-to-track interaction when it created the Rad-Schiene-Ausschuss (“wheel/rail committee”) 20 years ago. Initially, work focused on establishing a dialogue between technical units to promote a mutual understanding of the issues. Today, efforts are directed toward matching the technical units’ maintenance strategies. The committee’s efforts have resulted in a well-defined rail grinding and re-profiling strategy that is based on properly matched wheel and rail profiles. As part of its wheel / rail optimization program, Wiener Linien examined the development of corrugation on various track designs. A system of highly resilient discrete supports installed in tight (110 m) curves on the U2 metro line was shown to reduce secondary airborne noise generated by vibrations. This system also virtually eliminated stick-slip action and corrugation in these curves. Seeing the influence that the track-form had on inhibiting the development of medium-wavelength corrugations, the Austrian Federal Railways (ÖBB), the Bureau of Applied Mechanics and Mathematics (BAMM) and the Ingenieurbüro für Angewandte Technologie mbH (IAT) launched a “track dynamics” project to investigate the phenomenon. Data collected from 296 sensors that were installed to measure extension, acceleration and displacement in varying track-forms (including ballasted track with wooden sleepers, ballasted track with concrete sleepers, ballast-less track with plastic sleepers, and highly resilient discrete supports), indicated that the type of track-form had a significant influence on the development of medium-wavelength corrugations. Medium-wavelength corrugations developed in conventional ballasted and non-ballasted track-forms, and, most severely, in unpadded concrete sleepers embedded in ballasted track. Corrugations did not develop, however, in track with highly resilient discrete supports. The tests also revealed the benefits of separating the outer rail from the inner rail in the sleeper region — an approach that led to the use of “bi-bloc” sleepers in newly built metro tracks. While specialized approaches to dealing with corrugation or other wheel / rail problems were helpful, Wiener Linien recognized the need for comprehensive measurement of all portions of the system. In order to do so, it purchased two non-contact, track measurement vehicles — one for the tramway system and one for the metro system (see Profile Optimization in the Urban Rail Context). Data from these measurement vehicles, which record track geometry and rail profile data every 50 – 100 cm, enabled Wiener Linien to examine the interaction between “traditional” wheel and rail pairings and actual wheel and rail profiles on the system. An unworn “old” standard profile, several stages of worn profiles and a “new” wheel profile were paired with rail profiles collected on the individual metro and tramway lines and assessed, using equivalent conicity as a suitable parameter. Hollow-worn wheels represented one of the major wear categories (see Figure 1). Hollowing, which is common to railways around the world, is caused by two mechanisms: particle removal and plastic deformation. The task of tire material is to have worn particles lift off without any other negative impact, such as the early development of radial crack nuclei, on the tires. Appropriate alloys, hot rolling and heat treating produce a structure in which wear particles scale off almost horizontally without leaving micro-cracks perpendicular to the tread. This process coincides with plastic deformation of “tire material close to the surface,” meaning that the material will “flow,” slowly but steadily, in a lateral (axial) direction away from the wheel / rail contact patch area toward the wheel flange and the outer face of the tire. (“Tire material close to the surface” refers to tire steel down to a depth of about 4 mm, i.e. the depth where the material structure is still influenced by mechanical stresses.) The wheel tread in a cross-section of a Wiener Linien metro tire is worn hollow between the flange root and the outer long bevel of the wheel profile (see the area bracketed in green in Figure 1) after 150,000 – 200,000 km, and approximately 1.5 – 2 years of service. Corrective measures require re-profiling of the wheels. Preventative measures include ensuring that the tire material has sufficient strength and/or hardness without having too great of an abrasive effect on the rails. A more proactive measure is to spread wheel-on-rail contact across the entire tire tread. This is only possible when there is a balanced mix of tangent and curved line sections within a rail network. If wheel hollowing cannot be avoided, transit systems should aim to have as few outliers as possible within the wear profiles of a single vehicle. Wiener Linien has specified as part of its delivery requirements that same-type tires be measured and sorted by Brinell hardness (BHN) so that the maximum difference within one pallet is no more than 10 BHN. Wheel hollowing of greater depth generates a “false flange.” The causes of this condition are basically the same as those that cause hollow-worn treads, with a few notable exceptions. The false flange shown on the left is from a wheel on a ULF tramway car with less than 20,000 km and less than six months of service on Wiener Linien. Why would this condition occur after such a short period of time? ULF tramway cars are equipped with very small wheels, which generate higher surface pressure at the wheel/rail contact patch. ULF vehicles also have fewer wheels per “vehicle running meter” (as compared to predecessor models), resulting in much higher — almost twice as high — wheel loads. In addition to the higher wheel loadings, the last pair of wheels of a ULF car is steered too precisely by its suspension system. This pair of wheels cannot follow a sinusoidal movement. Because of their very low flange steering forces, this pair of wheels virtually always runs along the same path and infrequently contacts the rail at the outside of the wheel tread. With the small wheels and high wheel loads on the ULF vehicles, Wiener Linien elected to widen the tires on one of the prototype vehicles to ensure sufficient fatigue strength for the rubber-cushioned wheels. While this may reduce the incidence of false flange activity, the wider tire will not allow the wheel / rail contact to be spread evenly across the wheel / rail running surface. These issues underscore the importance of direct communication between the vehicle and track maintenance managers, the vehicle manufacturer and the maker of the running gear / wheels. The last one in the vehicle development chain very often is the wheel designer. Frequently he is expected to design running gear and wheels in compliance with applicable standards and service life requirements without being told how heavy the finished vehicle will be. This approach serves none, in that even the best wheel / rail profile pairing can be reduced to absurdity by overly wide tires. To combat this trend, tender documents for new tires used on Wiener Linien now include an optimized wheel profile.